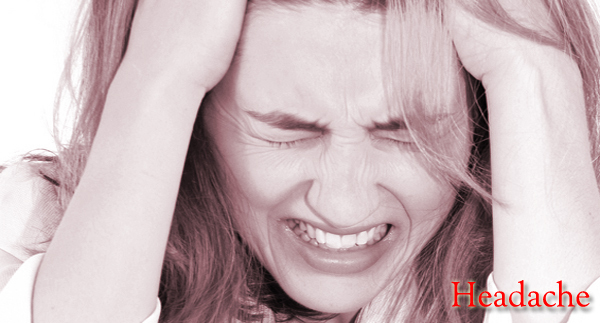 HEADACHE PAIN: WHEN THE PAIN IS REALLY IN YOUR HEAD! Headache is one of the to ten reasons for visits to doctors. Although there are many types of headaches, migraines or tension headaches are the most common. Although the pain can be frighteningly severe, headaches are rarely the sign of a serious disorder. Nontheless, headaches should be taken seriously and evaluated by a physician. Depending on the type of headache, pain may be felt all over the head or in a single spot on your farhead or the side or the back of your head. Soemtimes the pain moves from place to place. Pain may be dull and throbbing or sharp and piercing. With the exception of cluster headaches which are less common than migraines or tension headcahes, women are MORE likely than men to experience most recurrent headcahe disorders. In surveys of the general population, women also suffer more headache-related emotional distress and disability, such as anxiety and disabilty. Although it's not always possible to identify the culprit causing your headcahe, the most common triggers are psychological stress, sleep difficulties,irregular eating habits,hormonal shifts or resposnes to ceratyin foods.Working in a noisy or stuffy office , exposure to chemicals,cigarette smoke or fluoresescent lights and other enviornmental factors may play a role. An effective treatment plan for headaches MUST be based on a detailed and comprehensive preliminary physical examination and assessment. While there are many different treatment options for headaches, It is important that a physician evaluate the root cause of symptoms, as a first step.